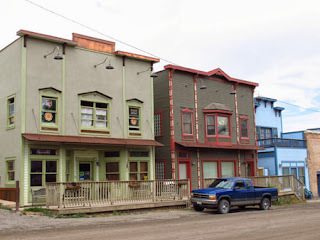 Ridgway—we had never heard of the town built in the Uncompahgre Valley at the foot of the San Juan Mountains in southwestern Colorado. But since we arrived at this old railroad town about lunch time, driving from Ouray to Telluride, we decided to stop and look around. 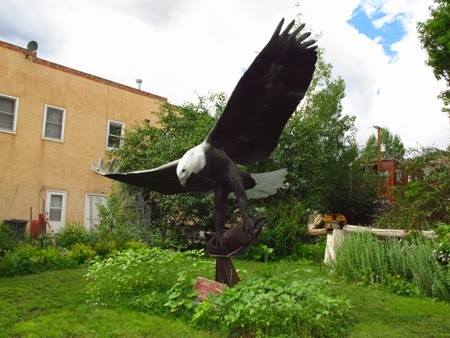 You can't miss the soaring eagle in Ridgway's historic section. The July day was sunny and warm, so we walked around the four-block historic business district along Lena and Cora Streets. 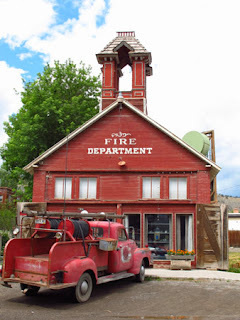 The first thing that caught our attention was the enormous eagle sculpture beside the old fire station—and the antique red fire truck parked in front. Founded by Otto Mears, the Russian immigrant and entrepreneur who built the railroad that went through the town, Ridgway almost disappeared when the trains quit coming in 1950s. 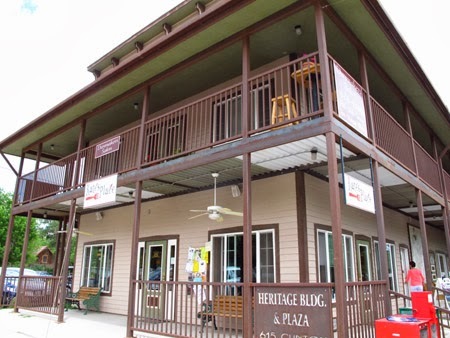 But loyal citizens worked hard to keep this town of 700 inhabitants going, revitalizing its western heritage and adding modern offices and recreational facilities. Many original 19th century buildings along dirt roads (The only paved street is Hwy 62, also called Sherman Street, that runs through town) have been renovated and now serve as restaurants, shops, and offices (a new fire station now serves the community). National Register of Historic Places plaques were a common sight. This pleasant community is a throwback to a simpler time, a fact that—along with its authentic buildings—has made Ridgway a favorite location for filming Western movies. 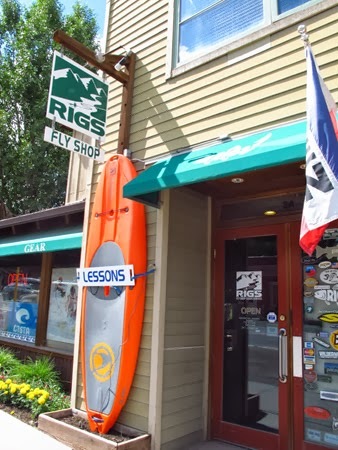 We stopped at RIGS, Ridgway Independent Guiding Service, to ask about a white-water rafting tour when we returned in a couple of days. Owner Tim Patterson, started his business 13 years ago as a fishing guide and has added a variety of water adventures, both mild and wild, on the Upper and Lower Uncompaghre River. Since water levels were currently lower than normal, we decided a kayaking trip in the Gunnison River would be just the thing to kick our adrenaline levels up a notch. We then ambled over to Kate’s Place, a lovely al fresco bistro that specializes in using fresh, local ingredients. Since it was Sunday, the restaurant serves breakfast until closing time at 2:30, and the fluffy pancakes delivered to a nearby table were tempting. But we opted for lunch fare, and Larry ordered a Reuben sandwich with home fries. I had a cup of creamy corn chowder followed by a hot roast beef sandwich. Both were delicious. just right of this historic building. Ridgway is a good example of why visitors shouldn’t judge a town on first impressions. Only on our return visit a few days later did we come to appreciate Ridgway’s ideal location as a hub for outdoor recreational activities.